US Airways Flight 1549 lasted all of five minutes, which was long enough to take off, lose both engines to a flock of Canadian geese, assess the situation, and make a plan. The efforts of Capt. Chesley Sullenberger, First Officer Jeffrey Skiles, Flight Attendant Donna Dent, Flight Attendant Doreen Welsh and Flight Attendant Sheila Dail exemplified the very best of the professional virtues of competence, teamwork and performance under pressure. Listen to the radio communications between the air traffic controller and “Cactus 1549” and hear just how utterly unflappable Capt. “Sully” was during those 5 minutes of destiny. “Everything should be made as simple as possible, but not simpler.” So goes the quote attributed to Albert Einstein. Somebody at Weight Watchers didn’t think this was advice worth heeding, as they announced back in September they were changing their name to “WW” … and no, the “WW” doesn’t stand for Weight Watchers or even their trademarked phrase “Wellness That Works.” Because of course. That would be too obvious. Often the stuff of sci-fi fantasy and perpetual-motion-machine dreams, nuclear fusion has long been described as the key to solving all of the planet’s power related problems. The premise is simple enough: whereas nuclear fission reactors release energy by splitting atoms, a fusion reactor works in reverse, by fusing atoms together and harnessing the energy that is released in the process. One major benefit of fusion is it’s much cleaner than fission. Because atoms are being combined rather than split, fusion doesn’t generate the radioactive byproduct of nuclear waste that we have to deal with currently with every nuclear fission reactor on the planet. It is one of those things that we know works in theory — there’s a bright, shining example of it that appears in the east every morning — but we have (thus far) proven unable to figure out how to make the theory work in practice. The main problem comes down to efficiency. Scientists are perfectly capable of fusing atoms together and collecting the energy by-product. It’s just that it always takes more energy to do it than fusion produces. You can see how that gets in the way of making a fusion reactor as a useful power source. While geographic North (the axis point around which the Earth rotates) remains the same, magnetic north is something else entirely. Not only does it wobble each day as the sun’s energy influences the Earth’s magnetic fields, but it is wandering over time due to the flows of the liquid metal of the mantle beneath the Earth’s crust. 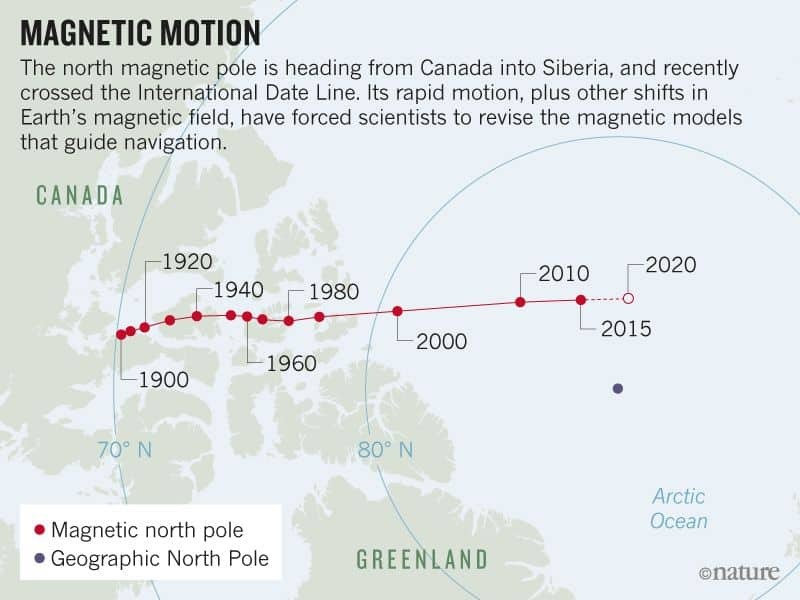 Whereas it started the 20th century in Canada, it is now in the middle of the Arctic Ocean heading towards Russia … which sounds like a plot line from an Austin Powers movie. What happens when you take a kid from one of the poorest and most crime-riddled areas of the country, hand him millions of dollars and put him on a “PJ” to the big time of the NBA as a top draft pick right out of high school? Darius Miles was that kid in 2000, and he will tell you. His piece in The Players Tribune is raw, unfiltered, tragic and a worthwhile read.